Tube Saturator is a real time tube amp plug-in. Unlike other tube simulators, which use radically simplified models, Tube Saturator uses state of the art circuit simulation technology to capture every nuance of an analog circuit. With circuit simulation, the analog schematic completely defines the signal processing. The schematic is converted into a system of non-linear differential equations which is solved at each sampling period, in realtime. That's mathematical talk for "it sounds exactly like the analog circuit". The circuit simulation technology is extremely CPU intensive, and hence we are only able to simulate very simple circuits. Tube Saturator is in fact a basic circuit consisting of a Baxandall type three-band EQ feeding two 12AX7 triode preamp stages. It's similar to preamp stages you'd find in a guitar amp, but it is by no means a complete guitar amplifier model, that would be way too expensive to simulate even with today's fast CPUs. However, it is extremely accurate, and hence you can get the same distortion and tonal characteristics that you'd expect from a real tube preamp. 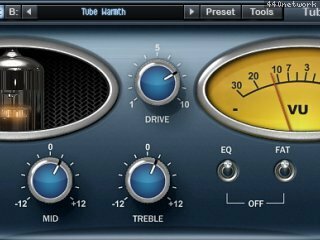 Use Tube Saturator to add a bit of analog warmth to recordings, or increase the drive for some distortion. You can use it as a saturating peak limiter too. Increasing the Drive control increases the (digital) input gain while decreasing the (digital) output gain, so you can easily adjust distortion levels. The FAT switch changes the bias circuit of the first preamp stage to increase gain.